By C. Moffat - December 2016. Kushner's guide to the study of kyudo is not actually a guide, as he states in the Introduction. Rather he describes the book as an introduction to Kyudo and Zazan to the ideals and practices of Zen Buddhism, including kyudo and zazen foundation techniques; breathing, posture and concentration, and covers the subtleties of more advanced practice. 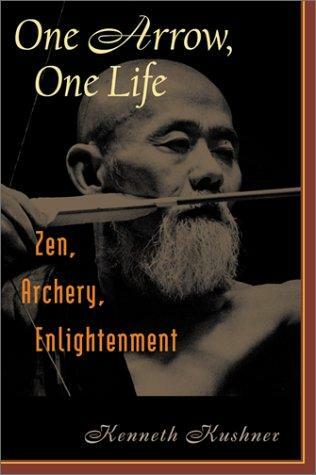 The Introduction also provides a narrative as to how Kushner personally got into Zen Archery during the 1980s in travels to Zen Temples in Hawaii and Japan. Ashibuni - Stance. Facing 90 degrees away from the target, place feet at 1.5 times the size of your shoulders, set at a 60 degree angle. Dozukuri - Torso. Tighten the inner thighs and the buttocks. This moves the abdomen forward and stabilizes the stance. Yugamae - Setting the Bow. Positioning the arrow and the hands on the grip and bowstring. 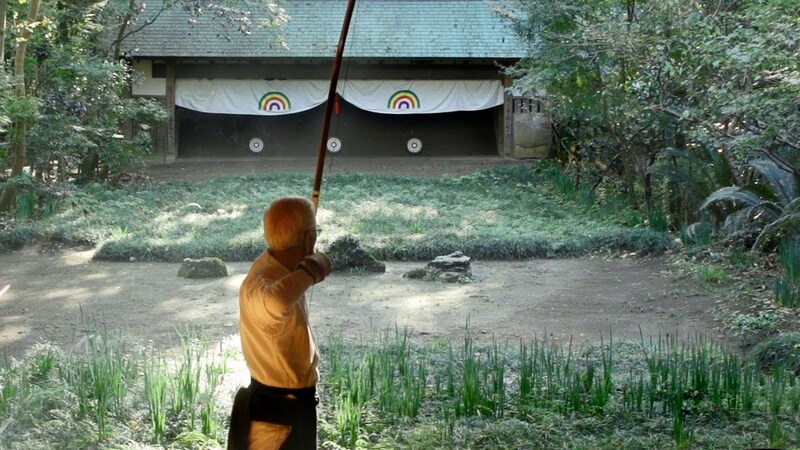 The kyudoka (archer) then studies the target, looks away 90 degrees, and then back at the target again. Uchiokoshi - Lifting the Bow. Raise both arms slowly, while keeping the arrow on an angle parallel to the ground, until both arms are elevated at 45 degree angles. Hikiwake - To Draw. The first part of this is Daisan, during which the kyudoka draws the bow one third of the way, pushing the bow towards the target with the bow hand, while the drawing hand pulls backwards partway with the drawing elbow bent at a right angle. After a pause at Daisan, the kyudoka continues drawing by pushing the bow towards the target, while the drawing elbow pulls away with equal force. By the end of the draw the arrow should be touching the cheek of the archer, with the shaft in line with the mouth [he mouth ends up effectively being the anchor spot]. Kai - The Meeting. 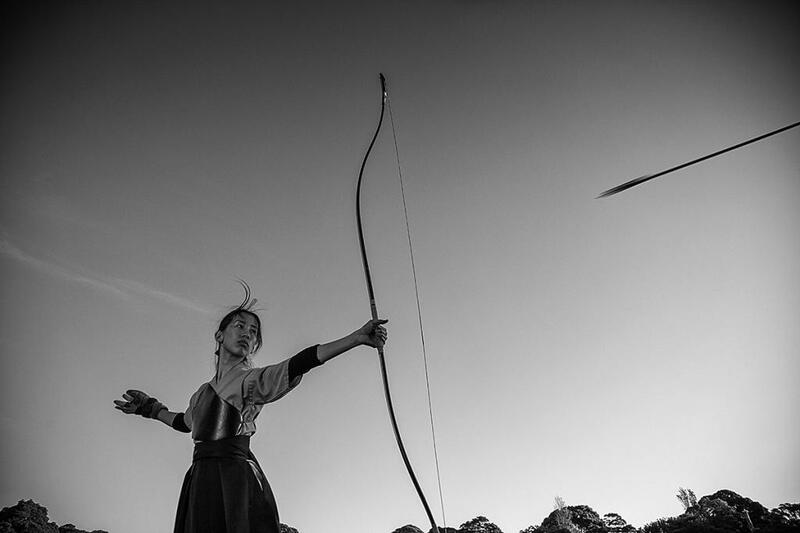 Hikiwake is then maintained while the archer breathes deep into their belly, while lifting the nape of the neck so that the chest expands. This increases the drawing power of the bow. The kyudoka then seeks to create a "perfect cross", both physically and in terms of their spiritual center. Hanare - Release. The tension on the string is allowed to increase until it slips from the kyudoka's fingers, creating a live release in which the drawing hand is thrust backwards by the tension, while the bow arm is thrust forward, with the hand loose on the bow so that the bow spins around so that the bowstring eventually points towards the target. Zanshin - Remaining Mind. With the body now in the shape of a cross, the new position should now be held for a brief moment while the archer inhales. The kyudoka then maintains their balance, posture and breathing that was previously established during the shooting sequence, while also being calm, alert and composed. Chapter Three (Breathing, Posture, and Concentration) talks about the interrelations of all three and how best to achieve all three - not just for use during Kyudo, but during meditation and every day life. Sadly I did not finish reading the whole book, but it is definitely on my To Do List (or To Buy List) to finish reading the book someday when I find the ample time. Chapters 4 to 10 look fascinating and I am afraid I only managed to skim them before having to return the book to the Toronto Library.